By the time Omar Crenshaw graduated from Appalachian State University in 2011 with a master's in marriage and family therapy, he knew he wasn't going to be a practicing therapist. Even as an intern, he found the daily grind of treating an endless array of social and family ills was taking its toll. "It was heavy," Crenshaw remembers. He turned to art to cope with the stresses of the job. 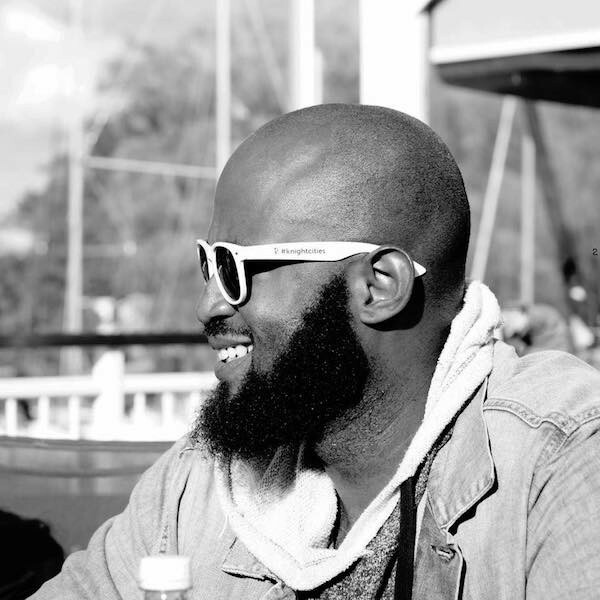 He began spinning records as DJ Hugo with the Charlotte music collective Hip Hop Orchestrated, the ambitious music-education project founded by CL contributor Kia Octavia Moore, which spotlights connections between hip-hop and orchestral music. He also started exploring street art as a way to express himself. But canvases, particularly the large ones graffiti artists prefer, can be pretty expensive. Crenshaw discovered an alternative to buying them. He learned that local theaters discarded their set pieces after closing shows; the background panels and wooden stage sets proved to be ideal canvases for his newest passion. But dumpster-diving yielded other great finds for Crenshaw, and as he continued to explore his newfound art calling, he realized that looking for treasures in trash could be an opportunity to give back to his community. Crenshaw talked to Moore, who had won a 2016 grant from the Knight Foundation's Emerging City Champions Fellowship Program, which funds projects in 13 cities across the United States that strengthen mobility, improve public spaces and enhance civic engagement. Moore encouraged him to apply for the same grant the next year, and Crenshaw won it — $5,000 to implement a project in Charlotte that he now calls Golden Nuggets. The idea: to teach budding artists how to see beauty and utility in garbage. 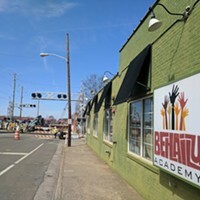 Hosted by the Charlotte non-profit youth organization Behailu Academy, Crenshaw's Golden Nuggets program trains middle and high school students to use discarded items to create art pieces that represent their cultures and communities. 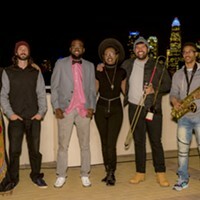 As part of the curriculum, Golden Nuggets plans regular student shows, and the next one will be at Baku Gallery, in NoDa, on Friday, March 16. Creative Loafing met up with Crenshaw, 31, on a recent night in Plaza Midwood to talk with him about the project and its future. 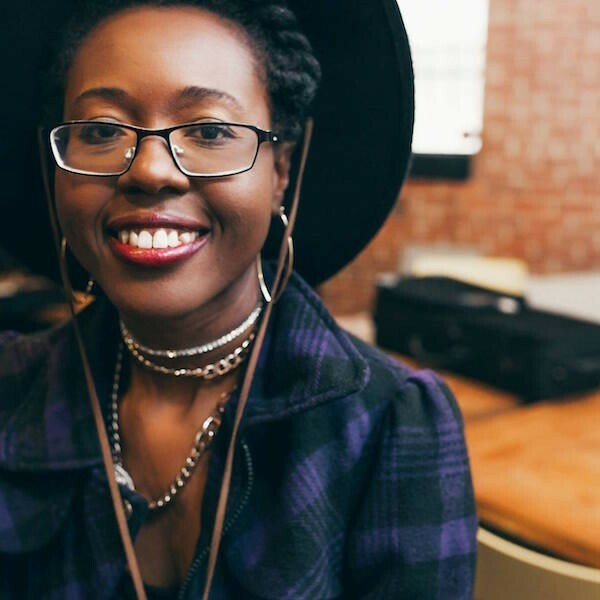 Hip Hop Orchestrated director and CL contributor Kia Octavia Moore. CL: What inspired you to turn your dumpster diving into Golden Nuggets? Omar Crenshaw: One of my friends [Moore] won the [Knight Foundation] grant, and she put together Hip Hop Orchestrated, which I was a part of. She motivated me to take my ideas to another level, and put it out there in a different way. I was then able to take what I know, with my educational background, and marry it with my artistic capability, and give back to the community in a way that would allow me to teach kids something that they could then use in various ways. How did you get the program into the Behailu Academy? Behailu asked me to come down and tell them a little more about my plans for the project, and what my projected lesson plans would be. They brought me up to speed on their own guidelines — what they would need to do, and how they ran their own semesters, things like that. We found a time to work, and discussed how we would go about getting materials, and storing everything. It all worked out, it was a very positive thing. What's the most positive thing you've seen come from Golden Nuggets? I think the most positive thing is watching all the awesome artists who are finding themselves and realizing their capabilities. A lot of them knew they were really good, but I don't think they really knew how good they were until someone actually gave them the tools. I've seen a kid having a bad day who doesn't really want to talk, but then you can see the expression of what they're going through in the art, and that's really cool — that's literally what art therapy is, and it's awesome to see someone going through a therapeutic process, unconsciously. A Golden Nuggets student shows off her work. With your background in therapy, do you think Golden Nuggets could be an alternative to the couch? I think some people are aware of what art does for their own therapy, and I think some people are doing it from a more natural place. It's definitely one of the goals of Golden Nuggets. I think it's something that I wouldn't mind seeing more a part of the conversation, to tap into the therapeutic nature of the creative expression of emotions, or whatever the mood of the day is. As a culture, we talk about mental health a lot, but we don't value it the way other cultures do, because we drive things like success into the ground. We don't talk about all the unhealthy things that come along with that. The frame of mind that art creates, the way it takes your mind off your stress — that, in and of itself, is a benefit, and if you can get someone even thinking about that at a younger age, then as they grow, I think they'll simply lead a healthier lifestyle. Have there been any major challenges? The biggest obstacles have been finding materials that were consistent. When I was dumpster diving to make my own art, it didn't matter if the piece was big or small, but when you have to find pieces for a group of nine, and try to be fair to everyone, because they all want the biggest thing to do their work on, that was a major obstacle. The other one, honestly, was staying on a lesson plan. [laughs] I sympathize with all teachers. I had built lesson plans before, but those were for a more college-type scene, and it's easier with college students. It's a whole different kind of wild card with kids. And the fact that you're giving kids spray paint, and they'll want to spray everything up. 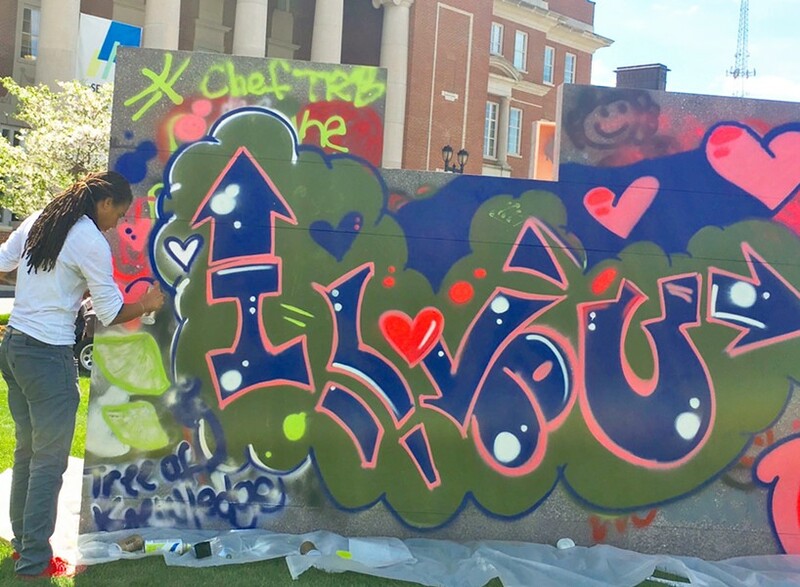 Do you think Charlotte is more receptive to street art these days? I've seen graffiti art in places where I never would have seen it before. I think it's something that Charlotte's coming around to, so hopefully in the next couple of years it'll grow. And there's definitely an underground scene that's been exposed, showing different artists and their abilities. You have murals being completed all around the city, so you can't say that it's not happening. 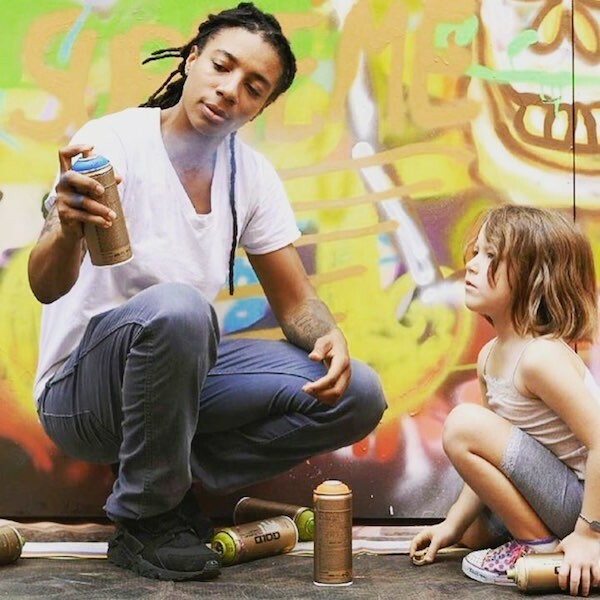 Artist and Golden Nuggets co-educator DeNeer Davis teaches a young student. Any specific artists we should look for? DeNeer Davis [a collaborator and co-educator at Golden Nuggets] comes to mind. She's an amazing artist, born and raised here in Charlotte. It's great to see her find ways to make street art in an acceptable and legal way. [laughs] She's not tagging up buildings and whatnot. And when she does do public art, it's commissioned and she does very good work. I would definitely check her out. So you think there's hope for this button-up bank town, after all? I feel like we're in a modern Renaissance era [in Charlotte], where creators are being unleashed. Everybody is creating and it's kind of wild. You can't really tame it, and there's no real form to it. Everybody's either a rapper or a singer, a painter or a graffiti artist. People are tapping into themselves. So I think you are definitely going to see this new wave of hippie people who see the benefits of the arts, and the vision, and aren't as bound to the structures of the 9-to-5. If you find a way to make jewelry that pays your rent, and that makes you feel good and helps you live your day-to-day life, then that's fine. You don't have to live the lavish lifestyle that you see people living on reality TV. 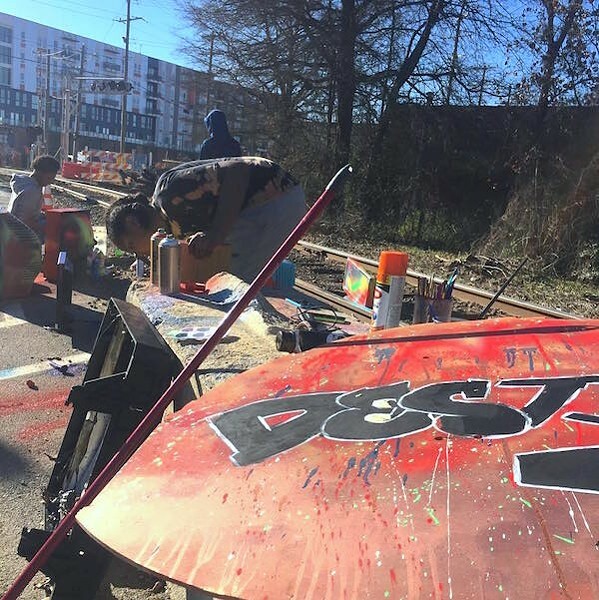 What do you see in the future for street art in Charlotte? I'd like to see a kind of space where street art and graffiti can be allowed to be made freely. We have other cities that are models for that. It doesn't detract from those cities or make them "tacky" or whatever. It actually adds to the culture of those cities. I'd also like to see more street art getting recognition. 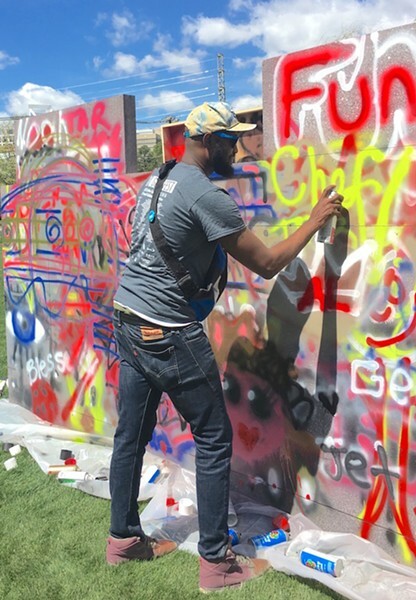 There are street artists making it happen, doing their own shows and things, but I would want to see it go a little bit further, into the galleries around the city, into a more public eye, and out onto some of the bigger stages, whether that's a Hornets game, or Taste of Charlotte, stuff like that. It would be great to see street art on that scene.